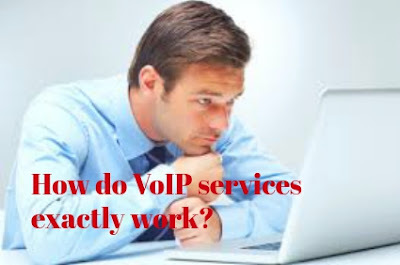 VoIP Services: How do VoIP services exactly work? How do VoIP services exactly work? One of the latest trends for a long time now, VoIP services is still not known to a lot of us. And, that's just fine. VoIP is the way to change our perceptions about long- distance calling! With VoIP services, you can send out small data packets over the phone or any other medium via the internet. VoIP is the most beneficial style to make free phone calls as you can bypass several additional charges and evolve with technology as well. VoIP is an exceptional, revolutionary technology and has immense potential to overcome major problems like expensive overseas, local calling, video conferencing and more. VoIP is a very clever revolutionary of the wheel and has 300% capacity to uproot the traditional PSTN phone systems! 1. ATA- Or, Analog Telephone Adapter is a way to connect your standard phone to your PC or, internet connection to ensure it's made use of with VoIP. ATA converts PSTN in to digital data transmission via the internet. VoIP providers like IP Momentum provide with affordable, unlimited VoIP calling plans all across the globe. 2. IP phones- They're specialized phones which look like the regular phones with a cradle, buttons, handset and more. They're directly connected to the router and have all the software and hardware right on- board to handle your IP calls. Wi-Fi hotspot can be used to make calls anytime, anywhere! 3. Computer to computer- The easiest of all- there's no need pay for long distance calls! All you need is a microphone, a set of speakers, a sound card, and a high-speed internet connection. They have to pat monthly ISP fees else, they do not have any major charges. VoIP services are an exceptional service with so many benefits to make use of. Be it their affordable calling rates to smart features like video conferencing, click to call, music on hold etc., there are VoIP providers in India like IP Momentum who guarantee all customer 98% network availability guaranteed and 24*7 customer support too. It's a must for all of us to try and adapt to VoIP services and get in touch with VoIP vendors like these to evolve with technology. If not so, you'll get lost in the process of sticking to the past.